I am so excited to share this cake with you today! It was my husband birthday, this past weekend, and we decided to have friends over instead of doing a restaurant meal. Its so hard to talk to everyone when sitting at a long table. This was much better. Everyone was able to chat and move around the house. The kids were there and other friends were able to bring their little one. It was all good. I made all the food, which was a lot of work, but worth it. We started with Somer’s Kick Ace Extra Sharp Raw Vegan Holiday Cheddar Cheese Ball. For a party full of omnivores this Cheese Ball disappeared! Also out for appetizers was a hummus plate with olives and pretzels and a bowl of mixed nuts. Simple. For dinner I made a Tomato and Roasted Eggplant Stew with Chickpeas from Veganomicon and Balsamic Roasted Tofu with Kale and Sun Dried Tomatoes by Melomeals. I didn’t have time to take pictures of any of the food because I was too busy taking pictures of the cake I made. I’m so very proud of it. I made all 4- 9″ chocolate cake layers the day before the party. The morning of the party I whipped up a ton of peanut butter buttercream. 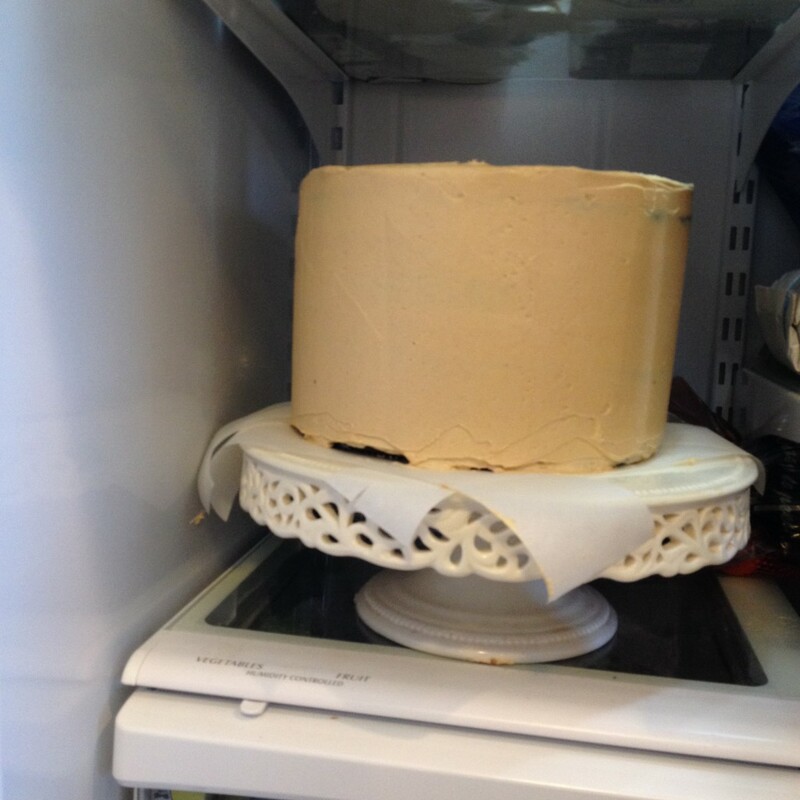 I though for sure I was going to have a lot of buttercream left over for another dessert but no. Not a drop was left and I’m not someone who loads on a ton of frosting. A few hours before the party I made a quick and thick chocolate ganache and poured it over the chilled cake. Chilling the cake helped the ganache harden while dripping so it didn’t pool on the bottom of the cake. 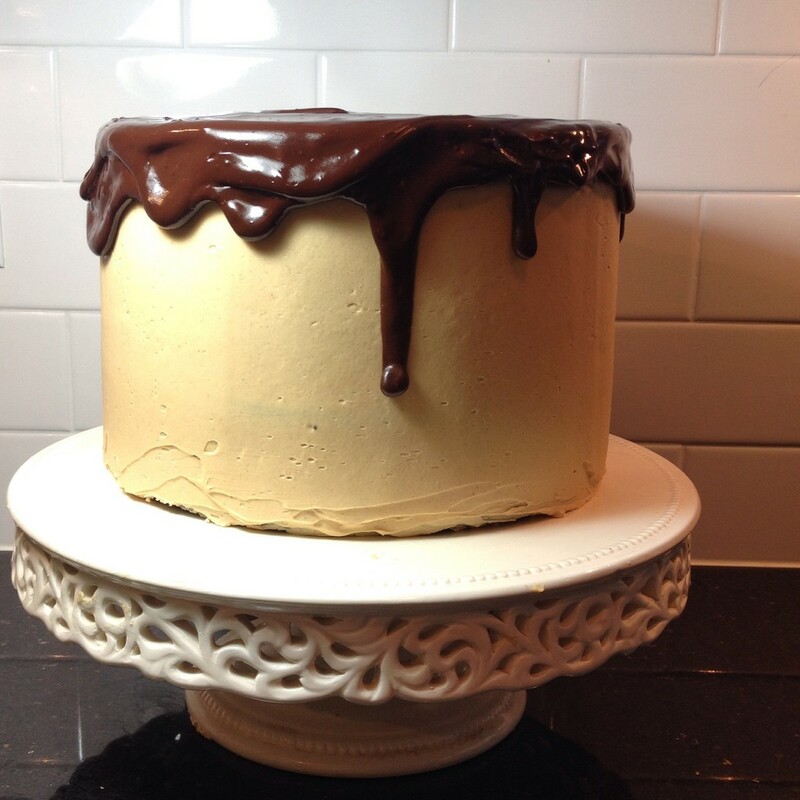 I really wanted most of the ganache still on the top of the cake with some drips down the side. I’m really pleased with how the drips turned out! The cake was almost 7 inches high and I swear it weighed more then my 3 year old son. I had to take a shelf out of our fridge to store it in there. It was all worth it though. It was delicious and everyone was happy to eat it. In fact we are still eating it! With 15 people over we still had half a cake left. 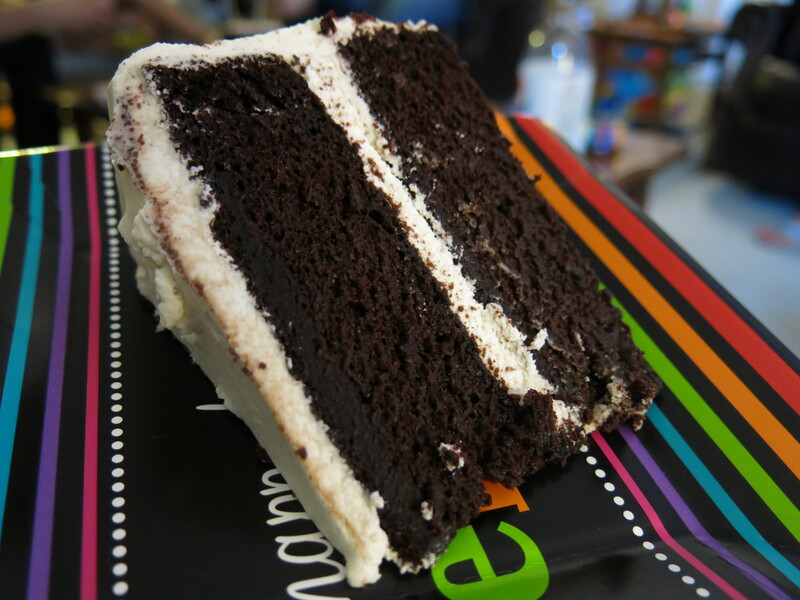 A really thin slice of this cake is more then enough. It could easily feed 25 people, I think. Thanksgiving is one of my favorite holidays. I love ALL THE FOODS and ALL THE DESSERTS! I overeat like I’m at an all you can eat vegan buffet brunch. I’m in tremendous pain afterwards. Its both worth it and not worth it but I put in the extra time at the YMCA the day before and after. This year both of my families (mine and my husbands) were celebrating together at my mother-in-laws house. It was a tight squeeze…my sister and I sat at the kids table..it was fun. I made most of the desserts this year. I went in the opposite direction of what is usually made by my husbands grandmother. 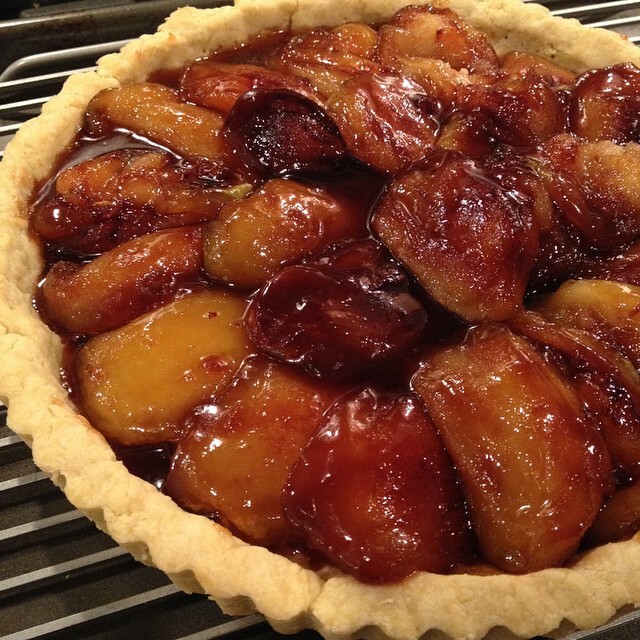 Instead of an apple pie I made a Tart Tatin from Terry Hope Romero’s book Vegan Eats World. It was my first time making this so I was nervous. It starts with an olive oil crust that is pressed into a tart pan and then frozen before baking. Thank goodness it was a pressed crust. I was not in the mood to wrestle with a rolled out crust! The apples were peeled, quartered, and cooked down in a vegan butter and sugar sauce that turned into a caramel that was later hit with some booze at the end. The tart was a complete success. It is definitely going to be my go to apple “pie” dessert. I topped my slice off with some So Delicious CocoWhip. That stuff was delicious! 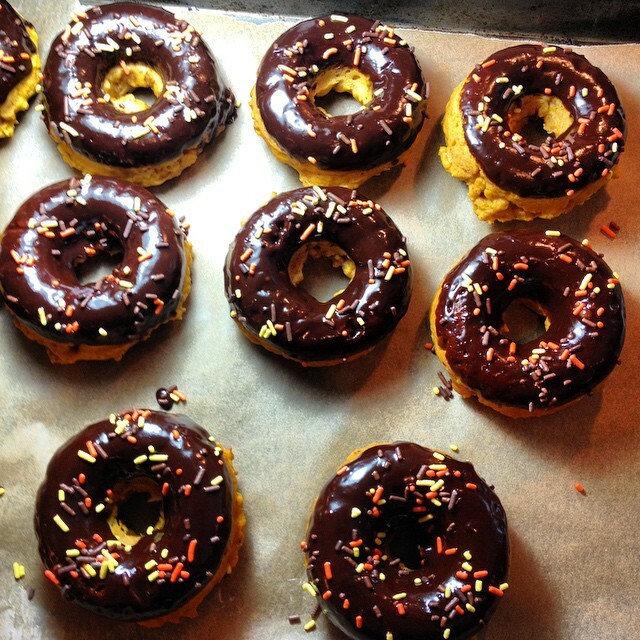 Instead of a pumpkin pie I made Pumpkin Donuts! I decided to go Donut over Pie for the kids. They wouldn’t have eaten either so this gave them something else to choose from. I’ve had a donut pan for years now and have never used it. I think I alway’s assumed donuts would be too labor intensive but cake donuts are as easy as cupcakes. They were really moist and delicious. I topped them with a chocolate ganache and sprinkles. I’m currently baking another batch of them for a Thanksgiving Potluck at my friends house. The last dessert I made with my 7 year old daughter. 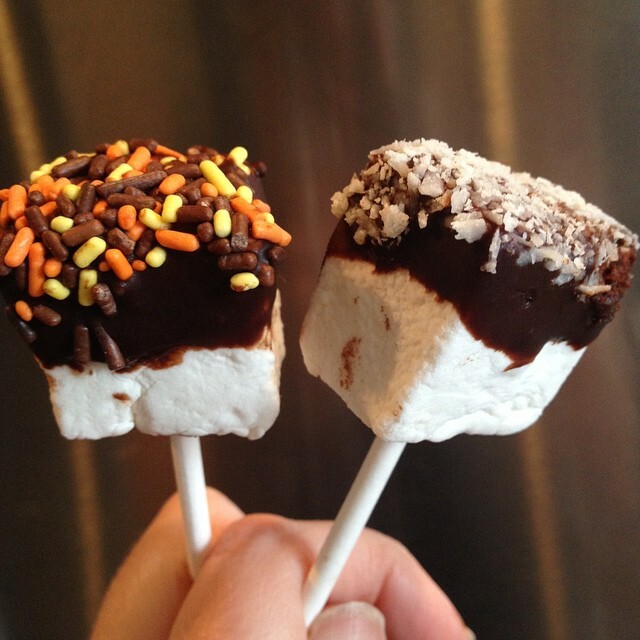 We had chocolate ganache left over from the donuts so we dipped Sweet and Sara Marshmallows, which we stuck a lollypop stick into them first, into the chocolate and then dipped them into either coconut or sprinkles. These were super cute and everyone had fun eating them! A dessert for all ages. Hope your Thanksgiving was full of awesome people, food and desserts! Somehow my youngest just turned 3 years old the the other day. Everything about his birthday had to involve dinosaurs. From the decorations, the presents, his clothes and even his cake. He is ridiculously and adorably obsessed. He really wanted his party to take place at the local Dinosaur Park, yes there really is one, but we will do that trip on a later date. His party took place on our deck for about 10 minutes and then due to torrential rain we moved it into our basement. He went back and forth on what type of cake he wanted. First it was just vanilla. Then chocolate. Then both and at last a dinosaur cake. I went with “both and dinosaur cake. I made a basic 2 layer chocolate cake using a recipe from the cookbook: Have Your Cake and Vegan Too by Kris Holechek from the nomnomnom blog. The frosting I threw together myself. Just the usual Earth Balance, powdered sugar, vanilla..etc..frosting. 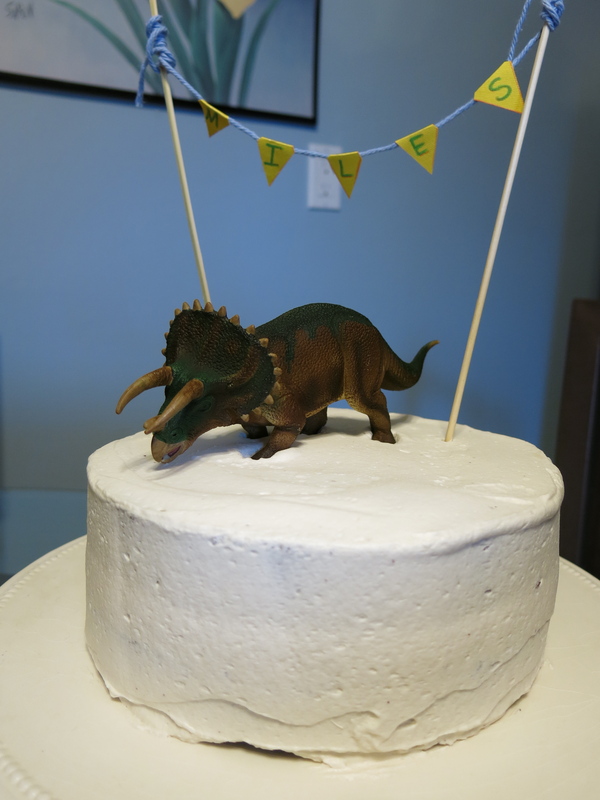 After frosting the cake I plopped on his favorite dinosaur and made a quick banner to make it a touch more festive. The cake itself was amazing. So moist and incredibly delicious. I took a risk by making a recipe I never made before and it paid off. A week later some non vegan guests were still raving about this cake! 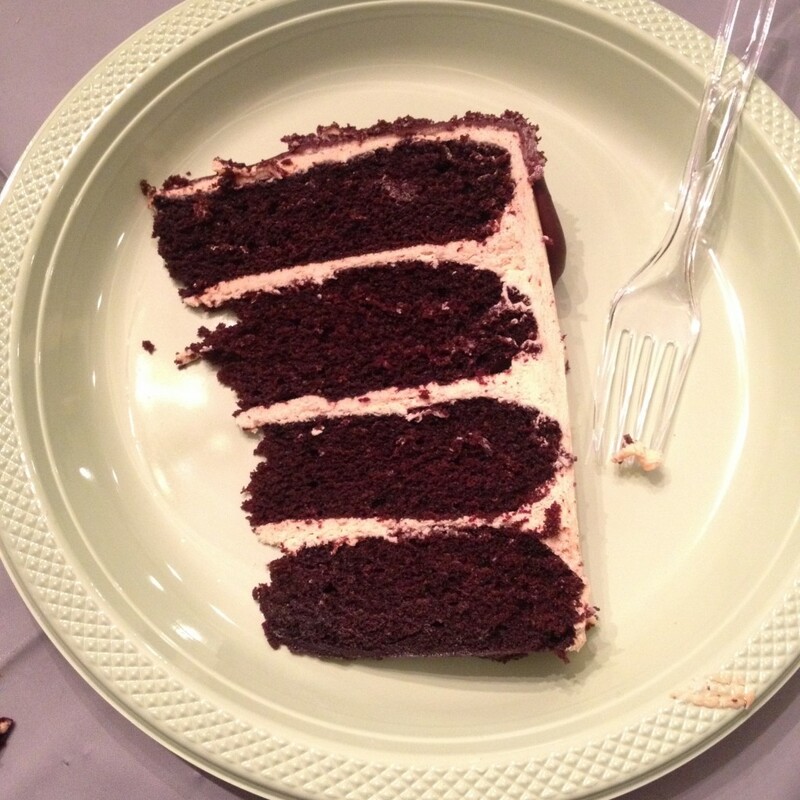 This is my new go to chocolate cake recipe and it should be yours as well. Most importantly the birthday boy was so happy with it. There was a dinosaur on it! So thrilling to a 3 year old! My birthday is coming up next and I will be making my own cake. This one! Maybe with a dinosaur on it. Since my bread baking success the other day and the fact that I now have a normal size oven I’ve been on a baking kick. You have no idea how happy my proper oven makes me. I had to buy all new baking sheet trays when we moved into this house because my regulation size ones just wouldn’t fit. It was ridiculous. I am also tired of wasting food. At least if fruits and vegetables go bad I can compost them but still I want to use what I buy. I bought a large container of organic strawberries for my daughters school lunches and they just weren’t going as quickly as they usually do. 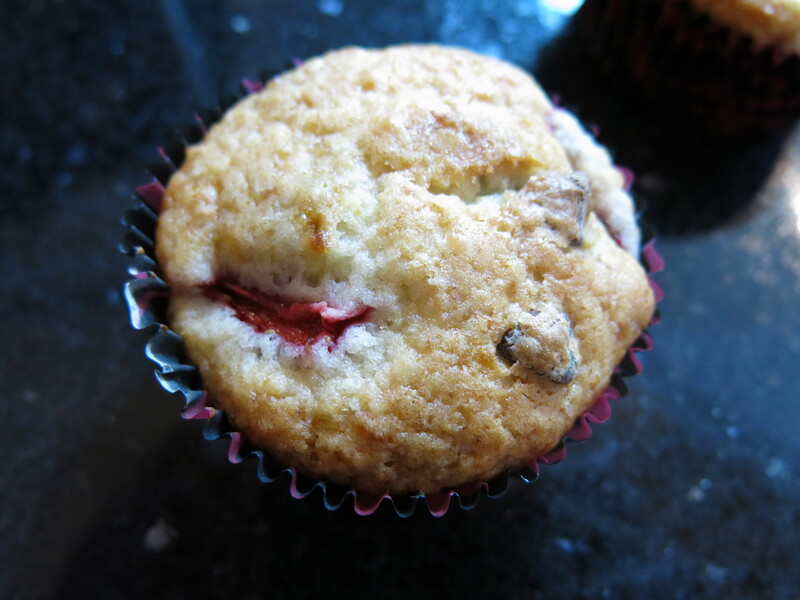 I figured baking them into muffins was a good way to use them up and what pairs best with strawberries? Chocolate! We always have bags of chocolate chips on hand. They are a favorite after the kids are in bed treat for my husband and I while we watch House of Cards on Netflix! Just like with the bread baking the other week I will admit that my kids and I sat on the floor in front of the oven watching the muffins bake. I ended up thrilled with how this recipe came out. It was perfect. They had a great texture and the perfect ratio of berry to chocolate. 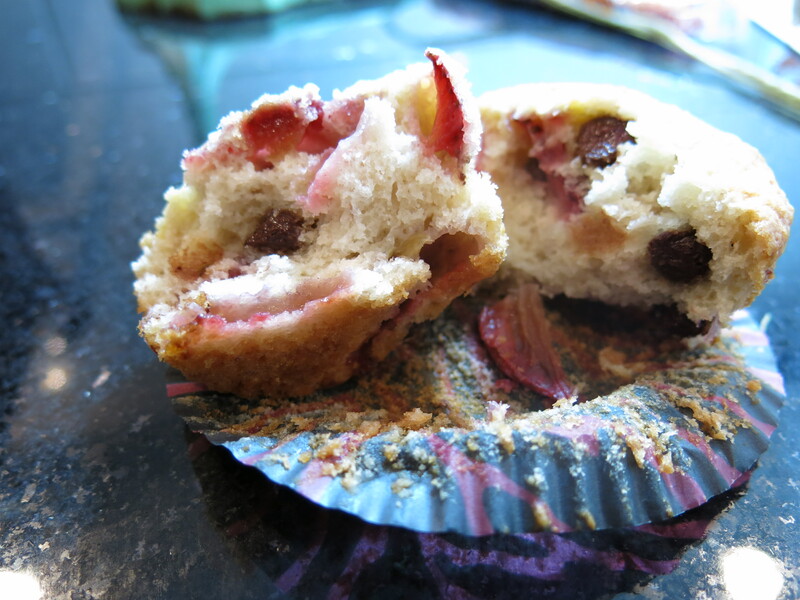 The top’s of the muffins browned nicely and most importantly, for me, the muffin liners peeled nicely without leaving chunks of muffin attached to them. I hate when that happens. What also surprised me was the sweetness of them from the sugar and strawberries. They were sweeter then I usually like, without being too sweet, but I loved that they were and wouldn’t change the amount of sugar in them at all. Even my husband, who isn’t into sweets, really liked them. I can’t wait to make these again. 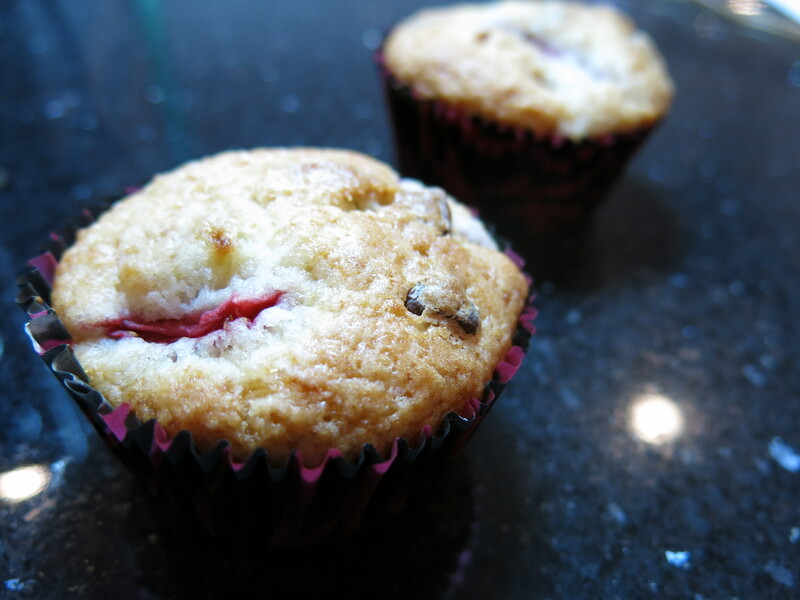 I have some blackberries in the fridge that are starting to go so I might be making another muffin recipe later today! Let me know if you make this recipe and your thoughts on it! In a medium size bowl whisk the flour, sugar, baking powder and salt together. Set aside. In a large bowl mash the banana with a fork or potato masher, add the melted coconut oil, almond milk, and vanilla extract. Whisk to combine. Pour the dry ingredients into the wet ingredients mixing with a rubber spatula. 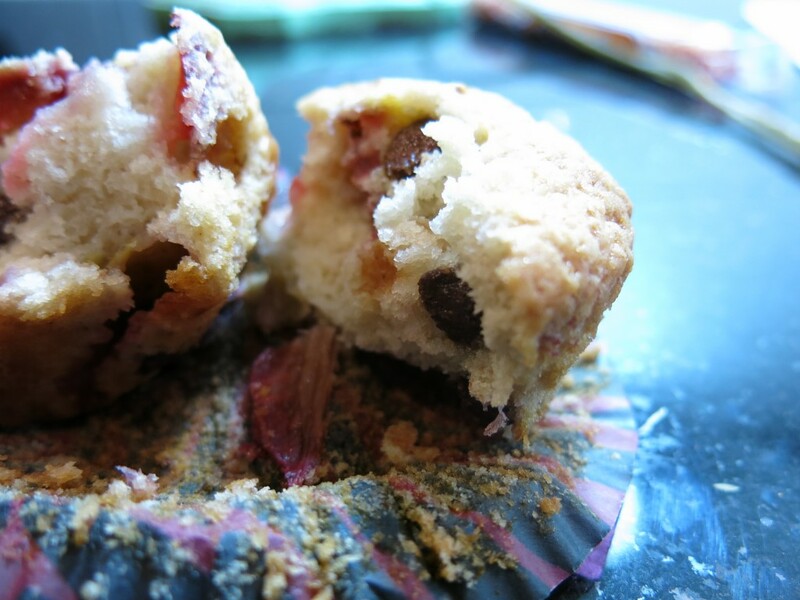 Once combined add the strawberries and chocolate chips and fold into the muffin mixture. Divide the mixture evenly into the 12 cup muffin tin. They will fill the tin more then 3/4 of the way up. Bake for 20-23 minutes or until the tops of the muffins are starting to lightly brown. 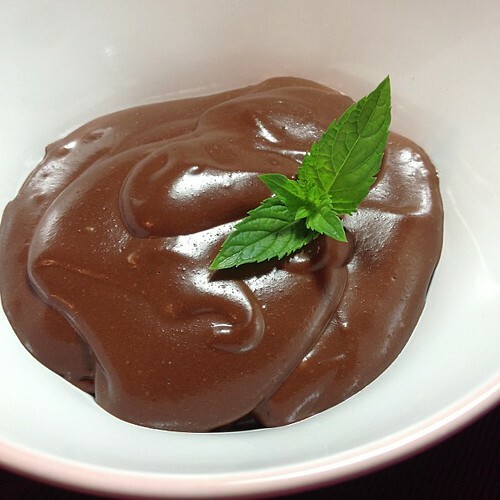 *if the almond milk is too cold it could make the melted coconut oil congeal which would not be good!